I am a Stephen King junkie. I admit it. I will expose that vein to him anytime I know he is going to give me that sweet hit of storytelling. I am writing two reviews tonight, both by Stephen King. The reason for the double reviews: I just finished reading Finders Keepers which is the sequel to Mr. Mercedes and I felt I must be true to the author and review each book in order. T his book review is on Mr. Mercedes by Stephen King. Since Stephen Kings “retirement” he has been able to write what he wants versus what the agency wants. He has said in several interviews that his love for books came from those old school crime mystery stories. I know a lot of the book reviewers gave him some crap about not writing a horror story because that is what he is known for, but Mr. Mercedes is not a horror, it is a crime mystery with some creepy images that only the Master of Horror can give. In the novel, Mr. Mercedes by Stephen King, we are introduced into the world of retired detective versus intelligent psycho killer. This is a true crime drama mystery storyline. The premise is about this intelligent psycho killer taking out a bunch of people in a stolen Mercedes car just to see what it felt like to do it and the detective who could not solve the case before his retirement. The storyline starts with the gruesome crime and then picks up with the detective now a retired washed out man with no purpose in life until the killer reaches out to him with a letter and starts taunting him to end his miserable life. As the retired detective (Det.-Ret.) realizes that the Mercedes Killer is stalking him, he sets out to finally finish what he started while still on the force, find the Mercedes Killer. The book is a great read. I believe I read it in one sitting because I was drawn in immediately and could not put it down until I finished the final page of the 436 page novel. 🙂 I loved the way Stephen King not only makes you root for the good guy and his haphazard band of helpers but also makes you understand the mindset of the killer and how the murderous acts are justified in that crazy mind. Only a truly talented writer can make you feel empathy for not only the good guy in the story but also for the most evil of all people and Stephen King does just that by pulling you into the minds of the retired detective and the killer and their day to day struggles with life in general. Det.-Ret. Bill Hodges is someone we can all relate to: retires after a successful career that engulfed his life only to find himself aimlessly wandering through life without a purpose anymore and too old to really find a new purpose to achieve in his life. He lives with that one regret of a case that he could not crack before his retirement and it eats away at him because of all the lives that were lost or affected by this crazy act. Mercedes Killer is an everyday person we can all relate to: steady job, home life, every day challenges of just living except for one thing, the desire to kill just to see what it would feel like, no reason, angst, or revenge motive, just because and that is it. There is an awesome cat and mouse feel to the book, like the two foes are circling each other trying to size the other up and find some weaknesses. The haphazard band of helpers consist of a smart up-and-coming college kid that likes to play around with his other “persona” he creates as a joke to tease Bill, a woman whom Bill is falling in love with, and her neurotic OCD cousin. 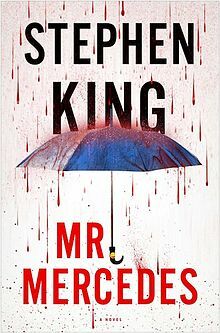 For those of you who have avoided reading Stephen King because you do not like reading “horror novels” I highly recommend you pick up Mr. Mercedes and give it a whirl. I promise you, you will not regret it! I give Mr. Mercedes 5 out of 5 Bookmarks and highly recommend this read to you, Dear Bloggites!